A woman simply identified as Amina Mohammed caused a scene at the Department of State Security DSS office, Abuja earlier today. 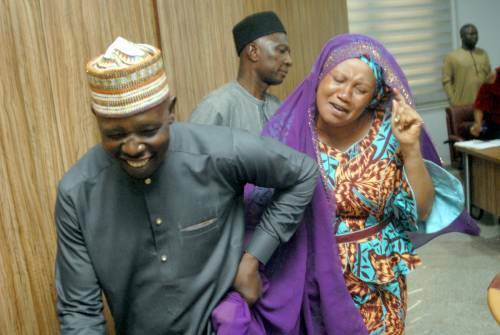 Naija News learnt that the lady accused of impersonation of the first lady, Aisha Buhari, shocked the press and DSS officials when she mentioned the sister of the first lady and ex-SGF, Babachir lawal, an accomplice of fraud. Speaking to reporters, Peter Afunaya, the department’s public relations officer, said the DSS arrested the suspect, Amina Mohammed, also known as Justina Oluoha, for posing as the first lady of the service. Kogi State. He added that Amina had defrauded a certain Mr. Alexander Chika Okafor (alias Chicason) of 50 million nairas in the villa, as part of a building belonging to the Lagos Court of Appeals. He added that Amina had promised to help her buy the property through the First Lady. The property would have been part of the federal government’s Presidential Real Estate Lease Implementation Committee. She used the false identity to evade protocol and security scrutiny, thus gaining unauthorised access into the villa and particularly the residence of the First Lady and Wife of the President, Hajia Aisha Buhari,” he said. “She took advantage of the fact that personalities of first ladies, ministers and certain categories of officials are not known through rigorous protocol and security checks at the Villa posts.